I used to travel all over the country with my Dad as a kid to all sorts of National Parks and other areas where he would take photos of all sorts of wildlife. Later in high school and through college I got heavily involved in music so I didn’t travel with him on these adventures as much anymore, but after I got back into photography a few years ago we’ve been shooting more together again. We decided to plan a trip out to Colorado to do some raptor photography in the plains area towards Kansas and then head up to Rocky Mountain National Park to see what we could find there. Landing in Denver we grabbed our rental car and then made the 3 hour drive southeast to the farm town of Lamar. This open area with nothing but farms, fields and cows happens to be a great spot for a variety of raptors to head south to for the winter from northern areas. We cruised backroads on the way over and did some shooting as we came across different hawks and eagles that were in range to get a taste of what the next few days would be like. We started early the next morning to be out there when the hawks start becoming active and increase our odds of catching something good. Our first full day consisted of continuous back road driving to come across Golden Eagles, Rough-legged Hawks, Northern Harriers, American Kestrel, Ferrurginous Hawks, Prairie Falcon, and several variations of Red-tailed Hawks. Where as back home in the northeast most of our Red-tailed Hawks look the same, the ones out west can be a number of different color morphs and are always exciting to see. Later in the afternoon we headed over to this state wildlife area to give it a look over and came across a pair of Great Horned Owls. Normally these guys are super skittish and take off when you are anywhere in their vicinity back home, but this pair just hung out comfortably with us nearby. With light almost disappearing for the day we made a note of the location to head back again tomorrow to see if they’d be there again. Our second fully day in Lamar was a repeat of the day before pretty much with constant driving on every road that had potential for raptors. A handful of Golden Eagles, Ferruginous Hawks (including some good opps on a dark phase bird), Red-tailed Hawks, Rough-legged Hawks & a cool scenic shot of a Prairie Falcon perched on a fence post. While cruising along a tiny dirt road we noticed a Loggerhead Shrike sitting on a bush so stopped to see if we could get some shots. The Shrike moved around a bit hunting for bugs and had success grabbing a few while we were watching. Then hopped around a bit on some barbed wire and I was able to get some good shots. We were lucky the bird was on the right side of the road to be in perfect lighting for the time of day. After firing off a few hundred frames of this guy we decided to get back over to where we had found the Great Horned Owls the day before. And to our excitement they were right in the same area of trees when we pulled in. They put on quite the show for us flying around and sitting on a number of different perches while we fired away shot after shot. Definitely one of the coolest experiences that I’ve ever had photographing wildlife. 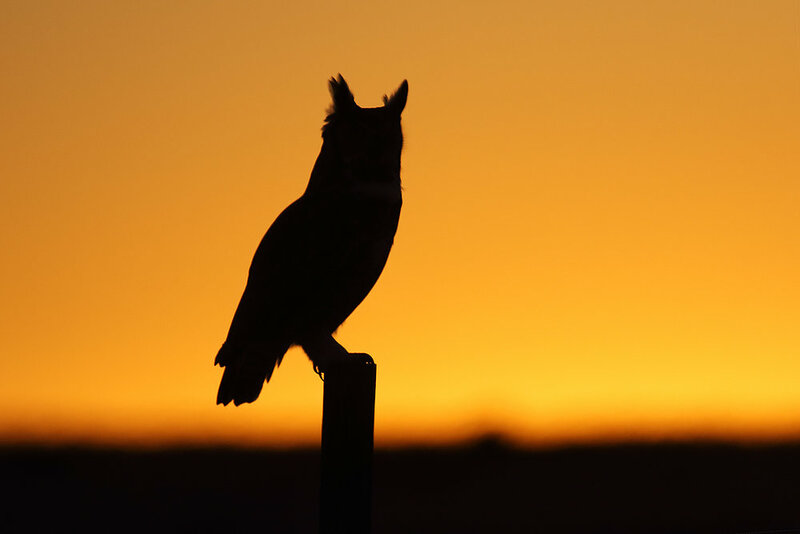 Even got a few shots of one perched on a fence as just a silhouette with the bright orange sky background after the sun had dipped below the horizon and then taking off to fly back to their roost for the night. We then headed back to our hotel after another long successful day of shooting. The next morning was our last in the area before heading out for the second half of the trip up in the mountains, so we cruised around a few of the roads that we had good luck on one last time. Not too many hawks in shooting distance but we did come across a coyote that made for an awesome scenic image where it blended in perfectly with the surrounding habitat. 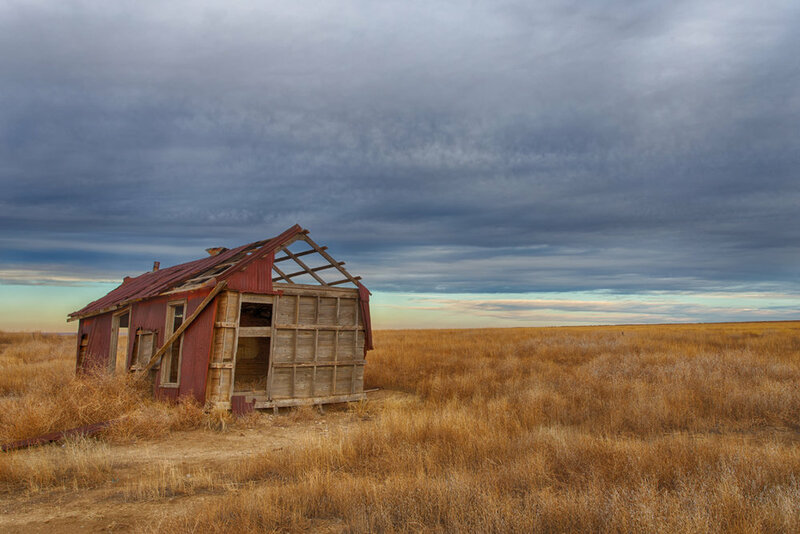 I also had seen this smaller old wooden structure on a farm field that was holding on by a thread to staying in tact and wanted to shoot it before we left the area. Had a cool dramatic grey sky which contrasted well with the warm tones of structure itself and surrounding grass. We took a scenic route north passing by some abandoned farmhouses that made for interesting photos and even had a Golden Eagle perched up on an old windmill. These are the kind of things that make this part of the country so unique and great to experience. We then continued the journey northwest to Estes Park, the home of Rocky Mountain National Park. This was my first time here so when we first got close enough to see the Rocky Mountains I was completely blown away by them. Not long after entering the park we spotted a coyote out in a field and managed to get a decent shot of him before he trotted off into the distance. We cruised around the park a bit and snapped off some scenic shots of the mountains before light was running out for the day. The next morning we started out early around the park for Elk and whatever other mammals we could come across. We came across a few Elk grazing in this field and was able to get some great images with the mountains in the background making for the perfect scenic as well. I even got one mid-air as he was leaping over a fence! A little bit after we had our first interactions with the Magpies of the park and these guys are crazy friendly. They must get fed by campers that are in the park during the warmer months because they were just flying and landing all around us. We were able to get some really cool flight shots as they were doing this and one even came inside our SUV when we lift the tailgate open haha. A little more exploring led us to a more wooded area and a handful of stunning Stellars Jays, that are in the same family as our Blue Jays from back home, but a much deeper solid shade of blue. A little more cruising around the park led us to a frozen and snow covered Bear Lake. Sitting at an elevation of 9,450 feet, the alpine lake rests beneath the sheer flanks of Hallett Peak and the Continental Divide. The view from here was incredible with a misty snowy fog covering the top of the mountainside and trees in the distance. 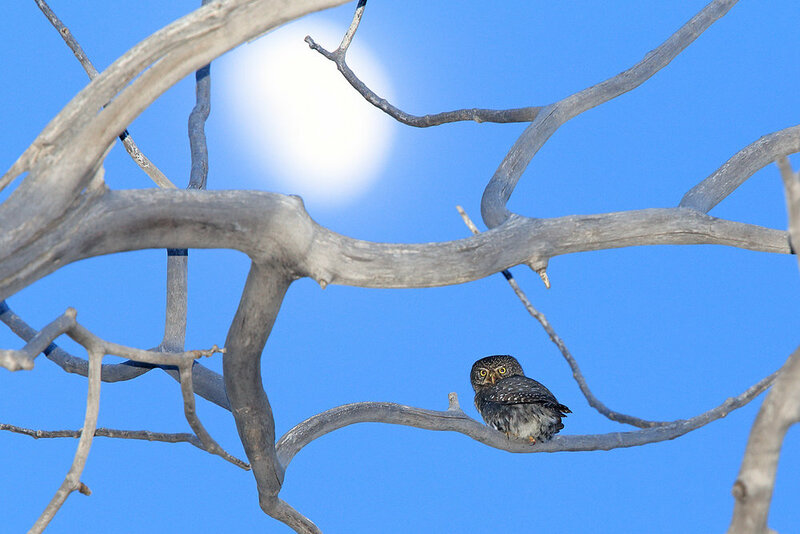 The last goal for the day was to find a needle in the haystack, a tiny Pygmy Owl in a huge area of the park. There were no specific recent reports on them being there but I had read that this area was good for them in years past so we gave it a shot. Somehow we were lucky enough to actually find one at the top of a nearby tree! He moved around a few times and we were able to snap a few shots as it was turning into night. I even got a shot of him on a branch with the out of focus moon behind him to his left. It was my first time seeing and photographing one of these guys so I was really excited. Our last morning of the trip we only had a few hours in the park before we had to start heading towards the airport and continuing the journey back home. So we decided to go back to the area where the Pygmy Owl had been to give it one more try. We somehow were able to find him again and got awesome shots in a few different trees. Couldn’t have asked for a better way to end off this amazing trip out to Colorado with my Dad.